In large strain elasticity the existence of minimizers is guaranteed if the variational functional to be minimized is sequentially weakly lower semicontinuous (s.w.l.s) and coercive. Therefore, polyconvex functions — which are always s.w.l.s. — could be very helpful for the modeling of isotropic as well as anisotropic hyperelastic materials. For isotropy a variety of polyconvex models are well-known from the literature. 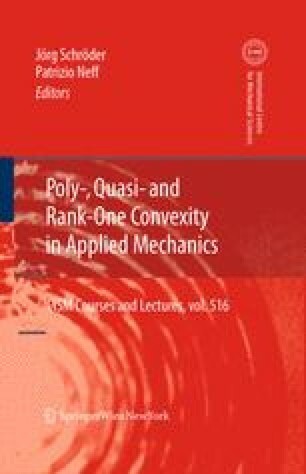 In this contribution we focus on the construction of anisotropic polyconvex functions, especially for the case of transversely isotropic and orthotropic symmetries. In order to arrive at a coordinate-invariant formulation we use the concept of structural tensors and apply representation theorems of tensor functions. — This review article is the result of a long, close, and fruitful cooperation with Patrizio Neff.